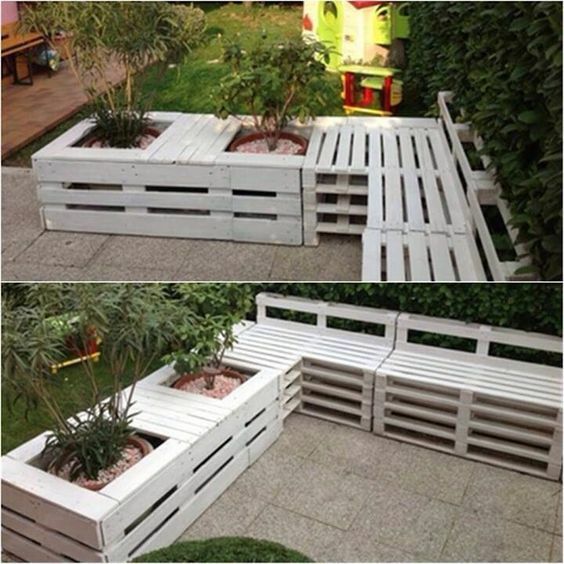 Have you been paying attention to all the cool things that you can do with pallets? 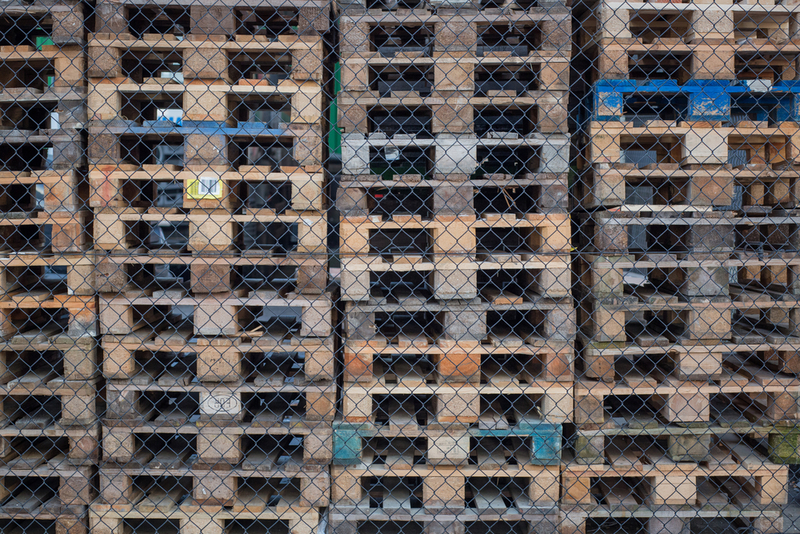 There are so many options out there that if you have a chance to get your hands on some pallets, it can be difficult to figure out where to start. 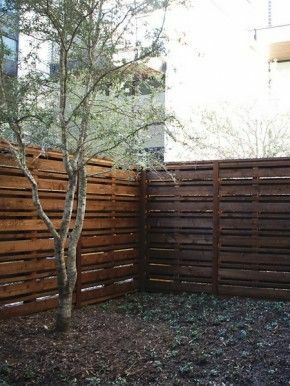 A pallet fence, however, can be an excellent choice. 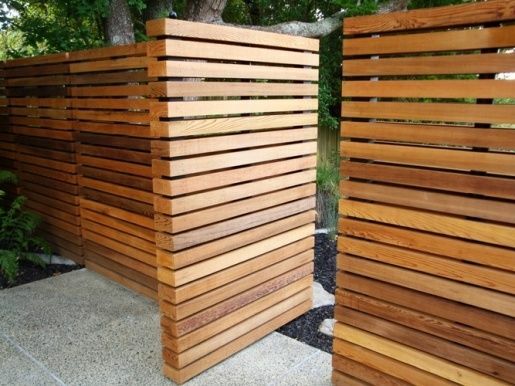 These types of fences will help you keep your privacy, and they’ll help you make a great statement about your sense of style. Your home is going to look great, and your fence has a lot of options to go along with it. You may not think so with only pallets to help, but you’d be surprised. The great thing about pallets is that most places will give them to you for free. That’s because they’re just pieces of wood that start to wear out over time and that those businesses have no use for them. So they give them away to whoever wants them and you can do anything with them. If you don’t live in an area where you can get pallets for free or if you can’t make the fence yourself, it could cost you something. Chances are you won’t have to pay too much because the pieces are inexpensive for anyone, even in larger quantities. That includes professionals as well. In general, you may spend a couple of hundred dollars on this type of fence (if you have to hire a professional to put it together and install it for you). You may only spend a few dollars on a full load of pallets and some nails to put it together, however, depending on where you live. Getting your pallets from a stackable unit to an actual pallet fence however, is going to require a little work. You’re going to need some skills (though not a whole lot) and some imagination. If you don’t have the ability to see what you want to create … well, it’s going to be a lot harder than you might think. 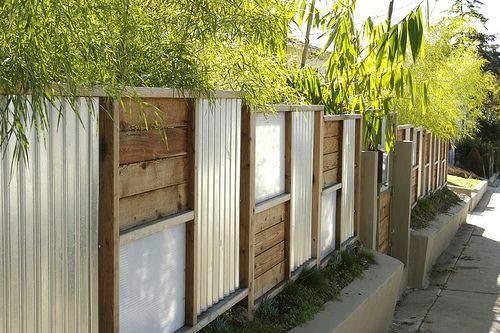 Luckily for you, there are plenty of different ways that you can create a great pallet fence. The best thing is to just use your imagination and create something that’s totally unique. Let yourself run wild with those pieces and see what you come up with. You may just surprise yourself. The key is using everything you have from the pallets themselves to different colors of paints and stains. 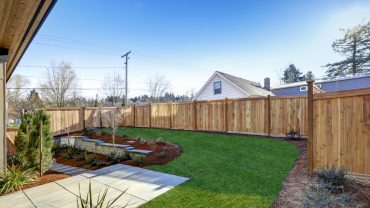 Before you know it, you’ll have a fence that looks like it took a long time to build, and it will only take you a short amount of time (and money). Of course, if you’re not exactly the fence design type, you’ll want to check out some of the great options we’ve found for you. Here, there are plenty of different looks and styles to the pallet fences and each one is going to be super easy to do. It’s up to you just how elaborate you might want to get (or how simple). 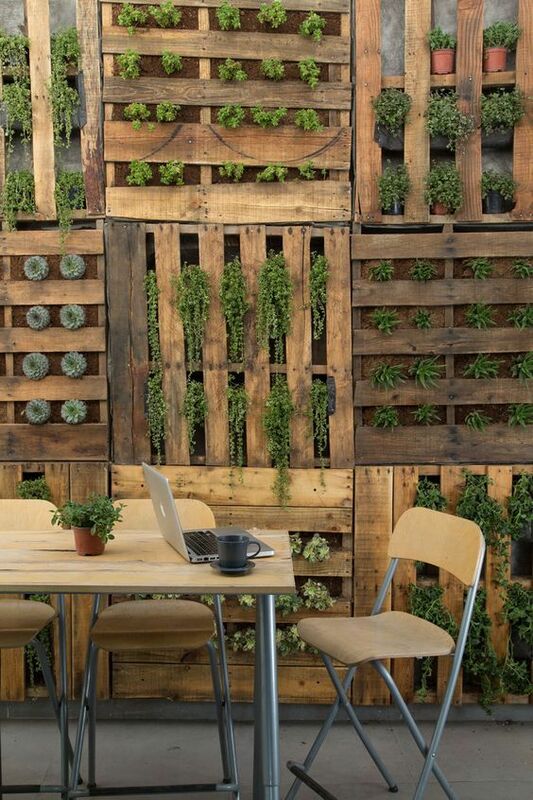 With standard style pallets and a little bit of paint or stain, you can create a walled garden. 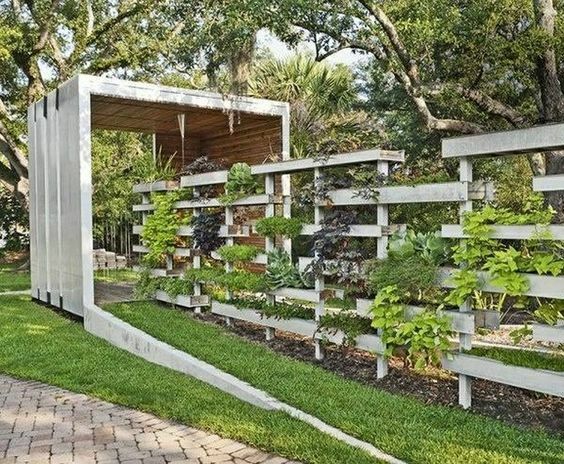 This one is easy to do because it’s just pallets stood up on end with plants hung over the sides. Here you have a little bit nicer pallets that have smaller spaces between each of the planks, so you end up with a bit more privacy. It’s also has a dark stain that makes it look more ritzy and elegant. 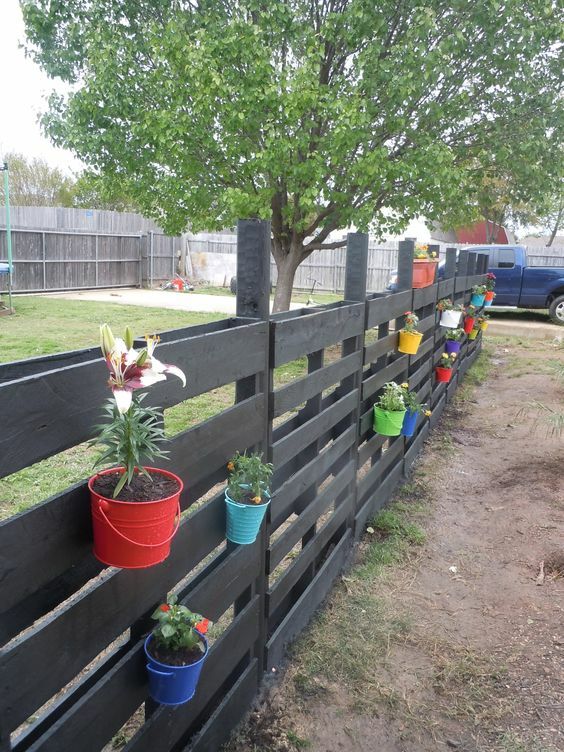 This pallet fence, is a constructed from a very standard pallet that you can find just about anywhere. You don’t have to do anything to it but stick some poles in the ground that it will slip right over the top of. This is a unique look, and it’s going to take a little bit of work with your pallets, but you can do it in no time. All you need is a saw and some nice looking stain. With this pallet fence you’re only using one side of the pallet so you don’t have the doubled section. It means a little less privacy (though still plenty) but a slightly different look. 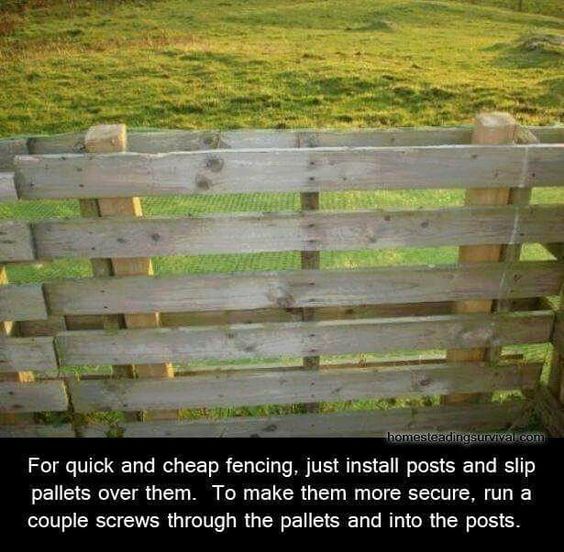 Stand your pallets up on their side and they look just like any standard fencing you could put up. It’s also super easy to install them and you’ll be done in no time. 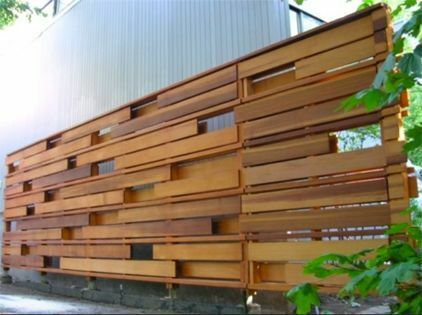 Here we have a more unique looking fence that actually uses pieces of pallets and pieces of sheet metal to create a new look. This is only sort of going to fit in with other pallet fences, but it’s still something neat. These pallets are all different colors and that helps them look more interesting and fun. They can all be stacked going the same way to get a cohesive look but with some variance. 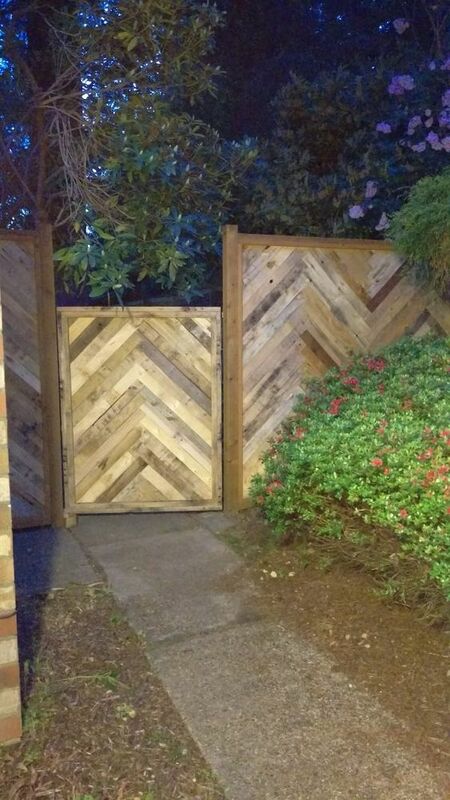 These pallets are designed differently to get this look to them and they definitely will create a professional looking fence. You feel like you have something great for an inexpensive price. 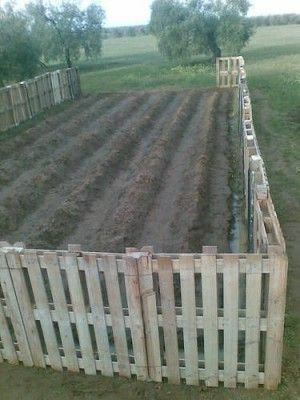 Though not exactly a pallet fence, these pallets are used to create a garden fence. They’re definitely something that will spruce up your garden and help it stay looking great. This fence is going to require a little added work once you get your pallets, but it’s going to be worth it, don’t you agree? 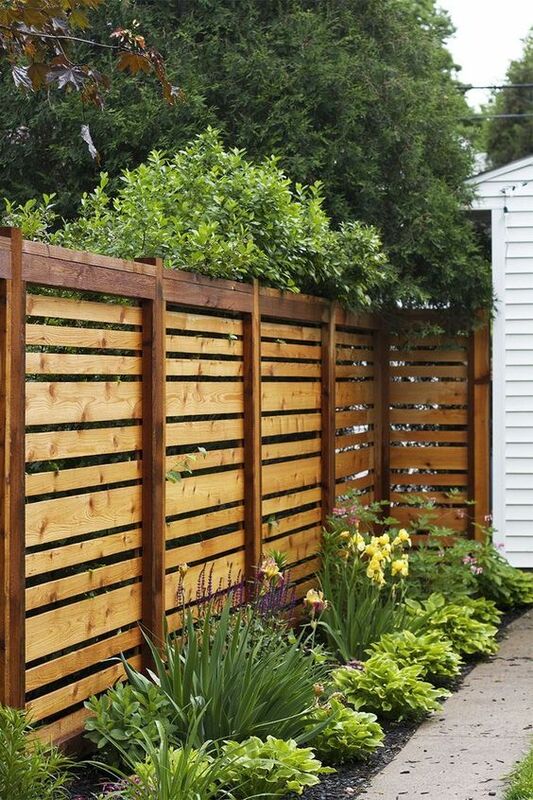 The fence has a moderate stain on it but the look is one you’ll want in your yard. Pull out a few of the pieces on your pallets and you get your very own arbor going on with vines and plants growing all through your fence. It’s not going to keep much private (or out), but it’s going to look great. Flip your pallets in all different directions and use them as plant holders and growers. 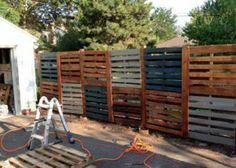 You’re going to have a great looking pallet fence and one with a fun pattern to it.